A year is a long time in football, and Sam Virgo has certainly made the most of it in 2015. Across the year, Virgo has played for her club, played for her state, and assistant coached the Youth Girls team. Regardless of how busy she was, it should come as no surprise to anyone that Virgo has taken out the Griffith Moorooka QWAFL Best and Fairest for 2015; she had a fantastic year. “I think it was probably my best year so far at the club. In the pre-season I really made some goals to improve my skills as well as my leadership. I was pretty determined to lift those elements of my game and I think that it definitely helped my on field performance and drive to push myself,” she said. Virgo shouldered a lot of the midfield load in 2015, which made it all the more important to put a big focus on a couple of key areas of her game in her eyes. “I just wanted to really work on my disposal and on my work rate. My work rate was okay in previous years, but my efficiency, especially in my kicking was a real goal of mine and I think I definitely upped that this year,” she said. It was a tough year for Griffith Moorooka on field, but that never changed how Virgo approached the year as a whole, and every single game. “For me personally, I think I need to approach my club footy the same way that I approach a state game. Making sure that I’m doing everything for the team, but also approaching every training session and every game in order to improve,” Virgo said. It clearly worked. In the 11 games that she played this year, Virgo was named in the best 10 times, and best on ground five times. How is that for consistency? 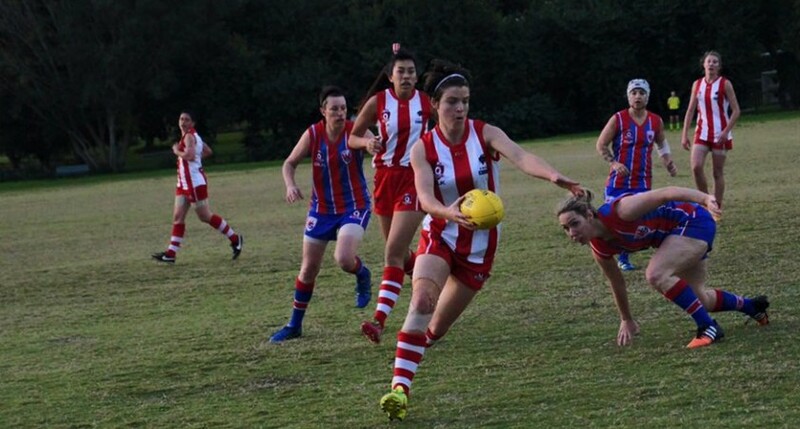 When she wasn’t dominating at QWAFL level, Virgo was a key player in the Queensland’s two wins over Tasmania and NSW/ACT respectively; an experience she couldn’t put a price on. “It helped me infinitely. It ‘s a level that we don’t experience at club footy, so it pushed me to get to a higher level. There are players in that Queensland team that I strive to reach their lofty heights; it definitely pushes you to improve, but also to make sure that you’re not going to drop off,” she said. It’s not just on field that Virgo was a big contributor in 2015, also parting her wisdom on the Queensland Youth Girls team in the National Championships in Western Australia. It all came about after running water a few months earlier. “I really enjoyed being able to teach people different aspects of the game at club level, so I approached Craig (Starcevich) and said that I would love to help out, especially the next group of girls who blew me away at the Under 17 Championships last year, and that’s where it all started,” she said. The coaching pathway is something that Virgo would love to continue. “I’m getting a bit old now so I probably would like to keep developing those skills whilst I’m still playing. When I have the opportunity to do that I will, and then when I stop playing coaching is something I would like to do full time,” she said. While Griffith Moorooka have opted to move into the QWAFA competition next year, Virgo will continue to play in the QWAFL. A new home hasn’t been completely decided yet, but Virgo already has her eyes on continuing to improve, and representing her state once again.